Thanks for checking us out! Our mission as a church family is, “Connect, Grow, Serve“. Our purpose is to connect people with God, grow faithful followers of Jesus, and serve the church, the community and the world. If we can be of service to you in any and all of these vital areas of life, that’s what we’re here for! 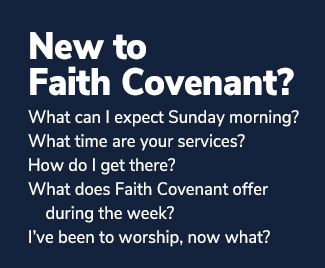 Faith Covenant Church is located in Farmington Hills, MI on the southwest corner of 14 Mile Rd and Drake Rd. Join us for worship at 9:00am and 10:45am.